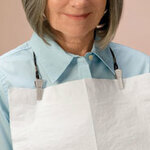 Adjustable napkin clip with nylon lanyard positions a cloth or paper napkin perfectly and keeps it in place. Also works for eyeglasses. Adjusts from 12 1/2" - 25 1/2" L.